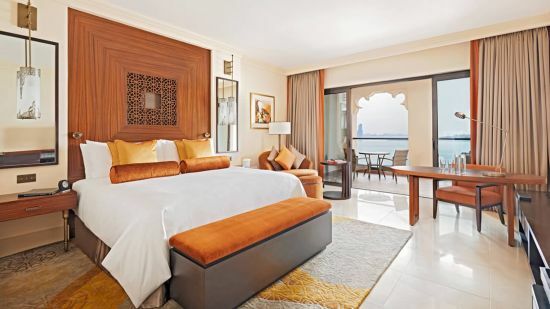 Fairmont The Palm offers guests the chance to revel amidst luxury of the highest class. Situated in the heart of Dubai, close to the spectacular Burj Khalifa and the best shopping, it's set for an unforgettable Dubai visit. The hotel will leave any visitor in a state of awe. Millions of dollars have gone into the Fairmont's lobby alone, to ensure guests receive the very best of experiences. Complete comfort is assured throughout the 381 guestrooms, suites and Fairmont Gold class. This hotel is perfect for business and leisure travellers, as well as guests requiring wheelchair friendly designs and additional support measures. Fairmont The Palm also boasts fantastic meeting and event spaces on the 33rd Floor. Exceptional restaurants provide superb dining experiences, combining the very best in worldwide cuisine and flavours. There's a rooftop lounge with the Dubai skyline as your backdrop and two of the trendiest nightclubs in town. Tranquil moments, rejuvenating treatments and a variety of leisure and sports is offered along with two rooftop swimming pools drenched in the morning sun and evening colour. There's over 40,000 square feet of health club facilities at Fairmont The Palm. All public areas are also wheelchair friendly plus there are shopping and activities to suit the whole family. Inter-connecting rooms are available for families or group bookings. Fairmont The Palm has an 800m private beach as part of the hotel. Jumeirah Beach is approximately 15km away. 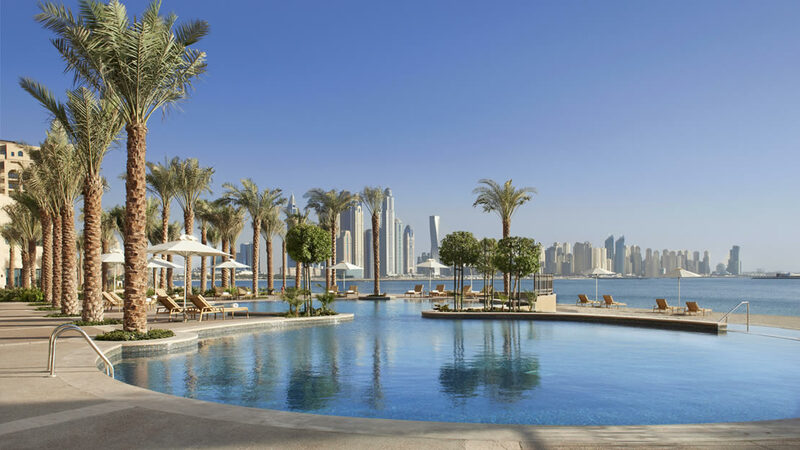 Fairmont The Palm has a fantastic location for accessing Dubai’s top attractions. To visit the iconic Burj Khalifa, it’s just a 20-minute journey, the Dubai Marina is a 12-minute drive and the Emirates Golf Club is 11 minutes away. Aquaventure Waterpark is a fun-filled day out, just 5km away on the crescent of The Palm. Dubai is also becoming a world-class shopping destination, and Fairmont The Palm offers a free shuttle service to the Mall of the Emirates so you can easily experience it for yourself. Dubai International Airport is approximately 33km away from Fairmont The Palm. Stunning accommodation featuring additional President Club privileges, or within the Fairmont Gold section allows guests to truly relax with luxury at their fingertips. Polished granite floors, panoramic views, private concierge and spectacular room sizes packed with exquisite decor and a contemporary style. 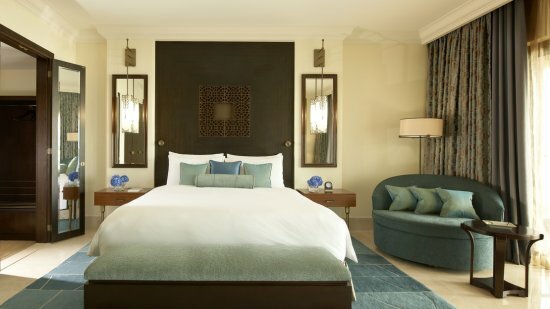 Add an array of first class services to these beautiful residences, then sit back, relax and enjoy the 5-star treatment! Accessible rooms are equipped with roll-in showers and adjustable shower heads, grab bars next to the toilet and accessible electrical switches and outlets. Further amenities are also available; just contact the hotel directly, and as standard, there is a choice of 1 king- or two queen beds. Guests can also access cribs, children's amenities (from concierge), and there are interconnecting room options too. Accessible room features are standard throughout. Up to 52 square metres in size, these contemporary rooms feature high-end design incorporating an Arabic Mashrabiya influence. Services such as work desk with media panel connectivity, 40" HD LED TV , and high-speed internet access make business and pleasure a harmonious mix. Style and comfort is assured with a generous balcony with Palm Residence views, five-piece marble bathroom with separate rain shower, and interconnecting room options. One king- or two queen-bed configurations is available. Between 48 and 52 square metres are filled with all of the Fairmont luxuries and high-end design features. Boasting the same technology as the Fairmont Rooms, this category offers that little bit extra in the shape of fantastic views from the balcony. Guests can look out over the hotel's stunning gardens and/or enjoy partial sea views. Step up the views with Fairmont Deluxe category and enjoy stunning views of the hotel's pools, Arabian Gulf, and Dubai Marina. At night the spectacular display creates a mesmerising setting, oozing romance and instantly relaxing. All provisions apply as per all of the Fairmont guestrooms. Revel in the elegance of these very generous one-bedroom suites. Beautifully decorated and comprising separate living area with sofas and coffee table format, high-speed internet and HD LED TV, in addition to a work desk with media panel connectivity, there is functionality blended with contemporary style. Interconnecting rooms are available for added privacy and space plus the generously-sized bathroom offers a walk-in shower and soaking tub. 139 square metres of lavish Fairmont holidaying combined with glorious views of the Dubai Marina, Arabian Gulf and hotel gardens; just heavenly! Enhancing the Fairmont suite range is the 201 square metre corner suite. Opulent, majestic and featuring a superb lounge area and dining table, this is an ideal choice for special holidays and guests requiring business and leisure facilities. 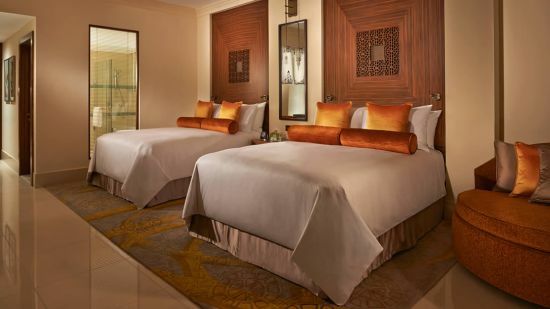 Additional space and a further exclusive private bedroom area can be met with a connecting Fairmont King-View Room and additional en suite. The main corner bedroom features its own en suite marble bathroom and all of Fairmont's exceptional amenities come as standard in this suite. Situated on the upper floors of the Fairmont, this modern and highly desirable suite comprises separate living room and dining area. An adjoining butler's pantry supplied with all kitchenette amenities meaning families with children can easily satisfy the variety of needs. This decadent space can be expanded by adding a connecting Deluxe room. One king-bedroom is standard as is a host of modern and contemporary furnishings. Revel in 178 square metres of accommodation. Stunning and highly functional don't often go together but Fairmont have excelled in providing both and with great attention to detail. Relax in 103 square metres of accommodation incorporating 5-star touches such as a separate living space equipped with sofas and coffee table, high-speed wireless internet access, HD LED TV and work desk with media panel connectivity. There is extra wardrobe space, a beautifully luxurious marble bathroom and a separate guest washroom. Interconnecting options are also available. 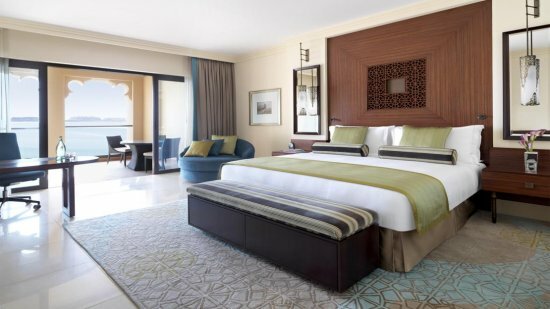 Modern design, Arabian inspired decor and the luxuries of a Fairmont break have blended perfectly in the Presidential Suite. Superlative 180 degree views of Dubai Marina and Palm Island add to the appeal whilst the suite itself provides marble and wood furnishing evoking the theme of grandeur. A living area and outdoor terrace, a dining room to seat 10 guests and a private butler's pantry will easily impress. The luxurious bedroom connects to a fabulous en suite with jetted spa tub and rainforest shower, An on-call butler service is standard with this suite and access to the Fairmont Golf services. This Presidential Suite boasts an impressive 390 square metres of living space. Raising the bar, Fairmont The Palm provides a sensational service to guests via the Fairmont Gold Category. Expect high-end privileges in lavish surroundings. The Honor Bar serves guests from 12pm until 11pm daily with juices, soft drinks, tea and coffee plus complimentary wines, spirits and liquors from 5pm until 7pm. Combine this with a highly attentive service where dinner reservations can be organised on your behalf, limousine transportation and exclusive lounge benefits. Evening hors d'oeuvres are served by expert chefs along with exclusive cocktails and an array of wine selections by the Sommelier. International buffet delights are served combining the much loved flavours of the Middle east, Asia and the Med. This venue takes advantage of superb beach views. Frevo is perfect for vibrant evenings spent with loved ones enjoying succulent meats and salads the Brazilian way. Carved at your table and to a backdrop of live performances, this is a popular venue at Fairmont! A beautiful venue where stunning views are the decor... Indulge in Mediterranean cuisine and fresh seafood. Complement the evening with fine wine and shisha. Guests must be aged 21 or over in the lounge. A fantastic takeaway venue delivering freshly baked goods, signature Fairmont sauces and culinary favourites. Delicious regional Indian cuisine with a quirky, vibrant and colonial feel to the colourful decor. Fairmont the Palm hosts a ladies’ night every Thursday, at Ba Restaurant, where female guests can enjoy unlimited drinks for AED 99.